Yesterday`s post was about How can you talk with your Computer like Iron Man`s Jarvis which is a easiest and free way to make your computer talk with you. Today, I will tell you how to make your computer speak what you type. You will type a text and your computer will speak it for you. How good is it our computer speaks it loud for us what we type? cool! Let`s have a look . 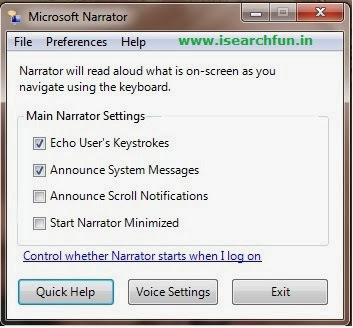 You all are familier with " Microsoft Narrator " -a windows free tool to narrate. Narrator speaks aloud what is on screen as you navigate using the keyboard.This is a free tool which speaks with your typing what you type using the keyboard . When we have a long sentence and want our computer to speak it for us? It`s also not so difficult, what you have to do is only to make a simple translator software yourself. That is a very easy task for you as the code is provided below. Now you have Done. Open Speak.vbs and Use. Suggestions are welcomed. Further Queries will be resolved. Let me know how helpful is this by comments.